It seems the Reminders team has been at work creating some new options to select when creating reminders on mobile. 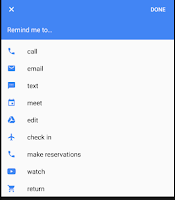 These new options can be found during reminder creation in both Google Calendar and Inbox by Gmail. 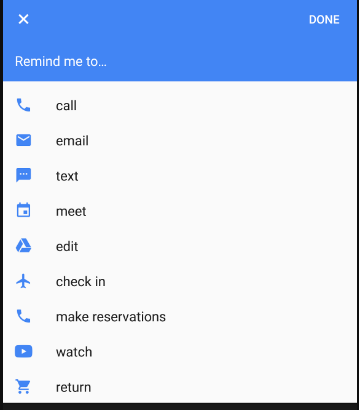 When creating a new reminder users are now prompted with a list of possible types to select as can be seen in the image on the right. There are others but these are the ones that seem to automate things better. 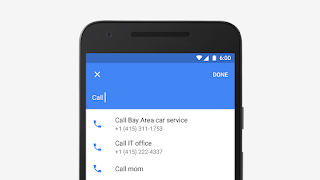 Each of these do also allow you to create a generic reminder related to that type of reminder. Hi Scott, I have posted this on the Google Calendar community for help but thought you may already know the answer and be quicker at responding, not exactly on the post but got to try, Roy. When I add a reminder on my android phone it also shows on my Chromebook in calendar, yet when my wife adds reminders on her android phone they do not show up on her chromebook calendar. I cannot see any settings differences on either the mobiles or on the chromebook, but obviously I am missing something.